I saw this meme today online and it got me all choked up. But perhaps not for the reasons you'd think. And that's what gave me the idea for today's post. 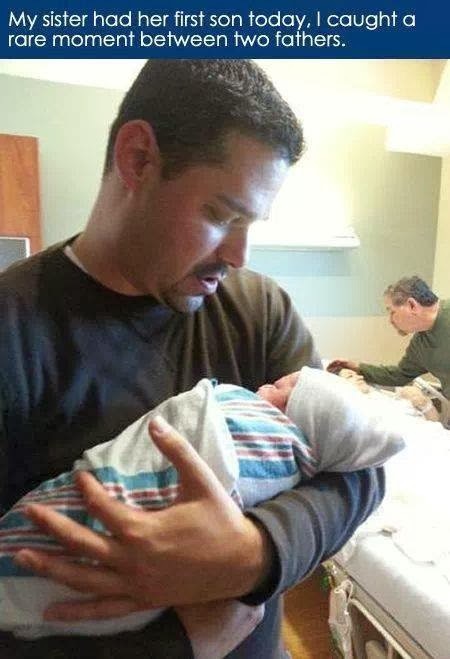 Most women will probably look at his as a tender moment when the men in her life were there for her...one of the many special moments of childbirth. Most men will probably see this as affirmation to the role of a father and/or that precious first moment of holding their baby in their arms. However, some will look at this picture and see a scene that they're missing from life. Maybe they wanted kids, but couldn't. Maybe their father is not the supportive type. Maybe they gave birth alone. Maybe the baby's father wasn't there for the birth. Maybe the father wasn't allowed there to hold his child. Maybe the grandfather was kept out of the picture because of a family feud. Maybe the mother died in childbirth. Maybe the baby was stillborn. Or maybe, like with me, this picture is a reminder of all the many moments me and my family members have missed because our father didn't live long enough to see them. The possibilities are endless. Not everyone has the gift of a moment like this. Most of the time, we'll look at a picture like this and only see it from our perspective...or from the perspective intended. Perhaps a stranger would see a tear drop from my eye and empathize with me, assuming I was remembering a similar beautiful moment in my life. But then, they'd be wrong. My mother died when I was 21 and my dad when I was 25. Since then, nobody in my family has had a parent to stand beside them for marriage, baby births, divorce, hard times or any of the monumental events that define who we are. Even though I don't want to be married and never want to have children, it still hurts that I won't have a father to give me away or a mother to teach me the ropes. This isn't a post about poor me, though. It's a post about how all of us have "stuff". All of us have challenges and pains we choose not to dwell upon or share with the outside world. Some are big. Some are small. Some, we may not even know we have. And you have no idea of my stuff and I have no idea of yours. But our stuff comes along with us for the ride everywhere we go. A discussion about smoking, for example, may cause me to defend the smoker because I smoked for 26 years and understand the addiction. Or it may cause me to lecture the smoker, because I lost a brother to lung cancer nearly two years ago. Or, like most of the time, I'll just stay out of the conversation altogether unless someone specifically asks for encouragement for quitting. Which way I go on any given topic on any given day depends on which pain from my lifetime is riding shotgun at the moment. And while you may be different, chances are you're not. It's human psychology and if you're not aware of this, it's something to consider. I think of myself as someone who is more self aware than the general population. If you're reading my blog, you probably fall into that category, too. But even though we might know what's driving our emotion, we still express it from time to time. Maybe we express it most of the time. And we're the self-aware peeps! So when you consider all the others out there in the world, there's just no telling where someone's response is coming from. And if you asked them, they might not even know themselves. Sometimes the response is going to hurt your feelings. Sometimes you'll agree with it. Sometimes you'll just think the other person is weird. Regardless, you don't know the other person's story, even if they're someone you know well. On top of that, we all came here with certain inherent challenges and shortcomings to surmount. We came with unique lessons to learn. We came with unique fears to overcome. Social skills to learn. And so on. By the time we can walk and talk, we're bumbling balls of imperfection. Some of the pain, anger and shame of that imperfection is turned within. Some of it comes flying out when we least expect it. Some of us received good instruction on how to be polite and sensitive to others. Others did not...or did and decided to ignore it. So some have better tools than others. And even that depends on the situation. It's really all the luck of the draw. Or, if you believe this way, it's what you chose to work on before you were even conceived. We all have our unique journeys to traverse here on earth. What you find offensive in others is really part of their sacred path, just as it's part of your sacred path to find or take offense from something that emanates from their sacred path. :D One of the Four Agreements is to not take things personally. And this is why. The things other people do—even when they're doing it intentionally to hurt you—are about them and the sacred journey they're on. Have you ever yelled at a salesperson at a store (or any random person for any random reason) for being slow, incompetent or whatever? Then a while later you felt bad because you overreacted because you'd had a bad day or whatever, right? All they know is that some lunatic yelled at them and finds them unacceptable in some way. Maybe they go home and cry. Or get drunk. Or hit their dog. Maybe you just affirmed everything their abusive mother ever said to them. Maybe they were slow or incompetent because they are developmentally disabled. You don't know. And they don't know you regret it. They don't know about your bad day. They don't know that you went home and cried because you disappointed yourself so much by yelling at them. So all that's left is pain and self flagellation. What this is all coming to is that, if we want to be the change we want to see in this world, we have to be gentler with each other. We have to be gentler with ourselves. We'll still anger or get angry at the random person from time to time. But we can choose to see another person's ill temper as their pain or fear. We can choose to see another person's silence as their lesson learned or as keeping the milestones of their sacred journey private. And we can choose to honor and acknowledge the good, bad and ugly of another's path, rather than to define them through just the eyes of good or bad. We can't do that, however, until we can embrace the good, bad and ugly of our own paths to the point that we can see the truth of our interactions with others and how they conjure up some part of our own sacred journey that still needs to be dealt with. It's easy to blame the other person for attacking us or making us feel bad. But that's all a smokescreen. Because what's really happening is that they're ringing a bell within us that needs to be rung for our own evolution. And while that bell may manifest as you deciding it's get-even time, the real reason is something that has nothing whatsoever to do with the other person. Until we can learn to greet another's pain and fear with compassion and self examination, we will continue to tread water on our own personal journeys.